I just bought a big bottle of your sweet tea for $29 and my husband and I took one drink and spit it out. We obviously tried to take it back to the store but the store owner said sorry I can’t take it back… He told us to contact you and maybe you could give us a credit or a coupon or something for a different drink. I was introduced to Firefly Sweet Tea Vodka by a friend while playing cards at sports bar. I ordered it the same way as my friend…… mixed with lemonade. 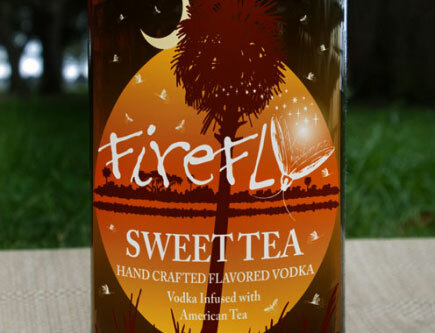 I eventually switched to straight Firefly Sweet Tea Vodka over ice with a wedge of lime. In my humble opinion, either choice is wonderful. This is definitely my drink of choice. Leaving 1-2 inches from top of glass. Top glass off with Firefly over ice. It is awesome. It is a must try drink. Serious query. Have you tried moonshine (the legal stuff) with sweet tea? Yeah, I’m from the South, too! God bless you! No clue who wrote this, I just was trying to figure out what to mix with my bottle of Sweet Tea Vodka, but this article is fantastic. The writing, I mean. Bravo. Im from Oregon ( ya, that left coast rat hole you all hear about)and I am impressed to say the least. This was my first flavored vodka and I mixed it with tonic water to sparkle it up just a bit. Its like tea flavored champagne. Love the firefly, try using tonic water for a little fizz and add a mint leaf! This stuff is pretty awesome. I spotted it at a liquor store up here in NY. Being the sucker that I am for flavored vodkas and having spent some time down south I had to get a bottle. Firefly got me on my long obsession with Sweet Tea Vodka. My favorite thing is to try new recipes. Do you a favorite? Have you had a chance to try the Sweet Tea Bourbon as well? If so, how is it in comparison to this? After trying the vodka in a bar (mixed half and half, as suggested), I decided I’d get a bottle for myself. I didn’t think they’d have both a vodka and a bourbon so I convinced myself the one I tried must have been the bourbon (versus the vodka I had actually tried). Well, I was wrong, but I wasn’t sure yet if I should return the bottle for the vodka or just go all in on the bourbon. Great post, by the way, it makes me want the vodka even more. My wife and her girlfriend mix it with Lemonade .. Its very yummy. Brandon definitely knows what he’s talking about, Deep Eddy is without a doubt the best sweet tea vodka product I’ve ever had. Jeremiah Weed, Seagrams, Firefly, etc don’t even compare to Deep Eddy. They’re all using low grade vodkas, non all natural tea, sugar syrup etc while Deep Eddy uses a premium 10x distilled vodka, all natural tea, and pure cane sugar. Needless to say Deep Eddy blows the competition out of the water and if you don’t believe me go try some for yourself. http://www.facebook.com/deepeddyvodka ~Check them out and see what true sweet tea vodka is really all about!